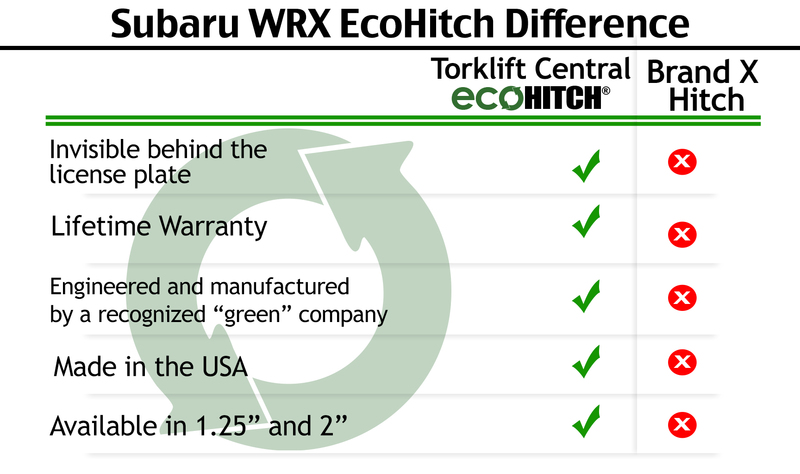 The EcoHitch® invisi hitch for the 2015-2019 Subaru WRX/WRX-STI is designed to be behind the factory knockout panel so the hitch is completely hidden when not in use, making it so you don't have to see an unsightly crosstube underneath your vehicle. Rated for 525 pounds tongue weight and 3,500 pounds towing weight, this WRX trailer hitch is full of personality that complements your WRX. *If you’re going to be towing and need trailer wiring, click here! Ensure your wiring harness does not drag on the ground by visiting our Eclipse trailer wiring bracket page. Safety is at the core of every Subaru including your Subaru WRX-STI and WRX. You need a Subaru trailer hitch that will match its high level of safety. With the WRX and WRX-STI EcoHitch® Invisi hitch, you are getting exactly that. Made to fit the aerodynamic contours of your Subaru WRX, this hitch for Subaru is engineered to meet stringent national SAE J684 towing safety standards. Our invisi hitch is installed behind the knockout panel – making it so the hitch is always hidden unless it’s being used. Instead of having a receiver hang below the bottom of your car, this Subaru EcoHitch gives you the most clearance possible by being located behind the knockout panel. Available in both the 1.25-inch and 2-inch receivers, you have plenty of options so that you won’t have to leave anything behind with this hitch for Subaru WRX. This Subaru hitch allows you to bring your bikes, a cargo rack for your belongings and so much more. Hitch fits all 2015-2017 Subaru WRX's with hidden knock out panel. Hitch will be completely invisible and the receiver will rest behind the knockout panel. Factory knockout panel is designed to be replaced when not in use giving the hitch the "invisi" look. Due to the invisi style of this hitch, all ballmounts/bike rack stingers cannot exceed more than 2-1/2” of an inch from the center of the pinhole to the end of the stinger. Failure to do so will cause ballmount/bike rack stingers to not fit or cause NON WARRANTIED damage to the spare tire compartment. To make your ball mount or bike rack fit, you can shorten the stinger to allow it to fit properly with the invisi hitch. Due to the hidden design of EcoHitch behind the rear bumper, people have expressed concern there may not be adequate space around the hitch receiver to easily install and remove these accessories. There are two options during installation of the EcoHitch that provide simple solutions to these concerns. For more information, please view our blog post here.